It has gotten to be somewhat of a passion. Creeping slowly through the forest, calling softly to one another, "Look!" "That one!" Then I rush up and take a picture. Some people like bird watching, some identify wild herbs, species of ferns, animal tracks and trailings, rock formations, moss species, fishes in the streams or flowers. 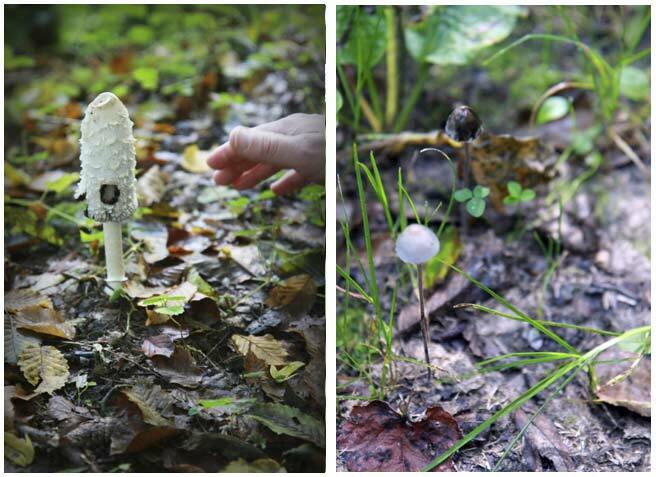 While it all fascinates me, we've both been curiously drawn to the wild mushrooms of Autumn. In our way and at our pace, we've been learning about them little by little. 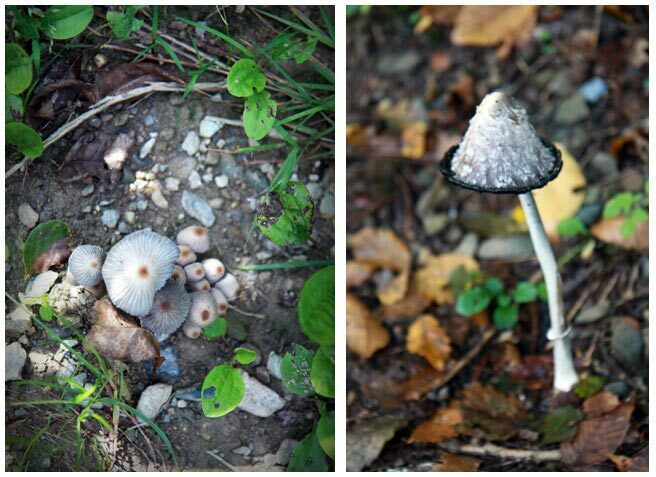 I think the best part of hunting for mushrooms is tuning your vision to find them. It takes a lot of concentration. Look right under your feet and at the same time, learn to get a feel for the conditions that different mushrooms thrive in. You might walk along saying to yourself, "oh how pretty, the first fallen oak leaves of autumn" but when you're out looking for mushrooms, you'll see those leaves on the ground and look up to locate the tree, then go find what might be growing in fairy rings at the bottom. Water rushes around moss covered rocks. Birds and chattering little creatures make up a kind of murmuring melody against the water sounds. But this is still punctuated by the pop and sharp echo of rifles firing in the distance, it being hunting season. The sound pulls us back, pushes back the temptation to believe that we are in a wonderland all to ourselves. We stick to the loggers trails and don't venture too far into communal forests, especially if we haven't checked at the Mairie to see if a group has registered to hunt that day. It is not a free for all, you know. Hunting is highly regulated here. All the same, this is the time of year when early in the morning groups of men with serious looks on their faces can be seen along the roads near the small villages holding rifles, their silhouettes stirring up images from long past, echoes of another time. I expect game hunting must be great fun. But I've never seen a smiling hunter along the road. Perhaps this comes from what they've learned about handling rifles. 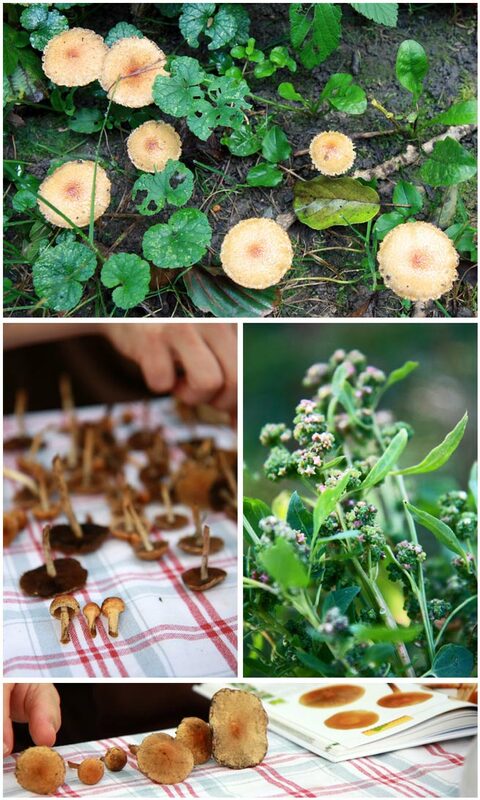 We could not help ourselves and we picked a bunch of mushrooms based on a hunch that they might be good to eat. Alas, the guide book we have warns of one mortally poisonous mushroom that mimics another perfectly delectable one that's good to eat, so what's regular amateur to do? In the end we didn't eat them. There were plenty of other foraged things to eat, like the chestnuts and walnuts that right now are falling from the sky. Who knows, maybe the mushrooms were edible, but you know, since we now have certain responsibilities, we don't dare. I would not say that is a complete change from the past, just an extra little nod, of thanks even, a chance to expand our souls for an instant and remind ourselves just how lucky we are. Chanterelles, a wild mushroom that is found in October, are plentiful in some forests. If you can't find any, definitely do not pass these up at the market when they are fresh and clean. Inspect them carefully. Pass over any with dark patches indicating they are saturated with water, mushrooms that are smeared with mud, or have excessive dirt and grime. Seek out the mushrooms that are in tact over fragments and pieces, which are more difficult to clean. They are best cleaned with a paring knife and a brush, (a stiff watercolor brush works well for me) carefully removing stray dirt from the gills along the bottom with the brush and paring off the base and any hopelessly muddy spots at the top. You can dampen a paper towel and wipe the tops as well if needed. 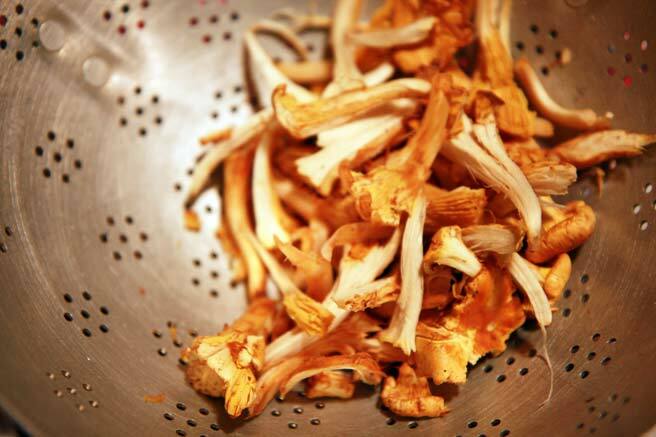 Soaking or rinsing these mushrooms in water is not a good idea since the chanterelle is spongy, unlike the black trumpet, which can be cleaned by a series of rinses. Trying to clean chanterelles with water furthermore turns whatever soil might be on them to mud that gets trapped in the gills. Try your best to avoid using water when washing your chanterelles. Once your mushrooms are clean, pull them apart into uniform sized strips, and sautee them until golden in hot butter that has been graced with a sprinkling of fresh minced shallots. Add the parsley during the last few seconds in the pan, and transfer them directly to toast. Enjoy while hot! You might try these with a little glass of muscatel, good music, and some friends to get your evening started. What a lovely blog! I have some mushrooms (alas shop-foraged only), which I will be using for this recipe tonight. Thank you! This evening I'm planning on a sort of lasagna, but using polenta instead of pasta and with layers of a wild mushroom ragu and baby spinach. people in crete are also mad on their mushrooms, but since i do not know the mushroom species well, i have always ended up buying mine from the stores. it is simply too risky to dare. We have a mushroom vendor here at USGM (Union Square Greenmarket for you non-NYC-based readers) but I never get there early enough to see if they have any chanterelles. For that I'd have to go to Citarella where they're usually priced at something like $7 per 1/4 lb. They're not cheap, but as a once in a while treat, they're well worth the cost. Just found your blog through The Kitchn...and I adore it! Bookmarked. Hi Lucy, I've just discovered your blog and it's amazingly beautful. 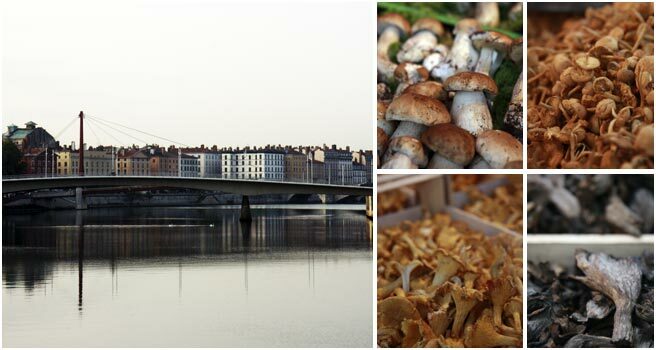 I used to live in Lyon so your picture of the Saône made me miss it. Gorgeous recipes and photos so I think it will become a favourite of mine. Thanks a lot, Vanessa. What a haul! I would love to taste what you prepare with these! I have always wanted to go mushroom searching.....lucky you! I just love all your photos. They do conjure up visions of fairies. How wonderful! This sounds like such a great hobby... I love the idea of eating something I found myself, and of course, the simple preparation is key. Your son is so lucky to grow up in that environment! This is such a beautiful post. I really wanted to go mushroom hunting this fall, but never got around to it. You found such a variety. I've always wanted to go to Oregon to hunt the matsutake mushroom, as it's myth precedes it. Thanks for the inspiration!